The Winner of Outdora’s Big Green Egg Recipe Contest! Congratulations to Mike Beaulieu, from Hamlin, Maine for winning Outdora’s original Big Green Egg recipe Contest. Mike’s Philly Cheese Hanger Steak Crepes received the most votes from our readers. In addition to receiving the official Big Green Egg cookbook, Mike’s recipe will be featured by one of our celebrity chefs at Sonoma’s First Annual Eggfest this Spring (sponsored by Outdora). We are still working on the details for the Eggfest but you can be sure that it will be one to remember. The rolling hills of Sonoma, wine country, good food and hundreds of Eggheads demonstrating their passion for cooking on this unique smoker grill will make this a memorable celebration. Outdora received more than twenty submissions and would like to thank EVERYONE who contributed an original recipe….or in some cases, recipeS. We are ALWAYS accepting recipes to share with our readers, so please, always feel free to email them to biggreeneggrecipes@outdora.com. Bravo to Marc Ippoliti in West Chester, PA for submitting his Dizzy Pumpkin Sliders recipe to Outdora’s original BGE recipe contest. Fall is here and pumpkins reign. What better way to celebrate the season than by firing up Marc’s recipe on your Big Green Egg. “Dizzy Pumpkin Sliders” is just an abbreviated way of saying “ground chuck sliders over pineapple-headed butter grill fried pumpkin gnocco-buns”. According to Marc, “Two-tone dizzy spices work well, the sweetness of the pumpkin and caramelized pineapple head crust on the ‘bun’ followed by the savory peppery-ness of the chuck burger, wed by cheese, all I can say is it tastes like buttery meat candy.” Marc recommends serving the Dizzy Pumpkin Sliders with beer. To vote for Marc’s Dizzy Pumpkin Sliders, simply check on the Facebook “like” button next to his recipe post. The original Big Green Egg recipe with the most Facebook “likes” wins the Big Green Egg Cookbook and will also have their recipe featured at Outdora’s first annual Big Green Egg festival. Do you have your own Big Green Egg original recipe that you’d like to enter into the contest? If so, email it to biggreeneggrecipes@outdora.com. 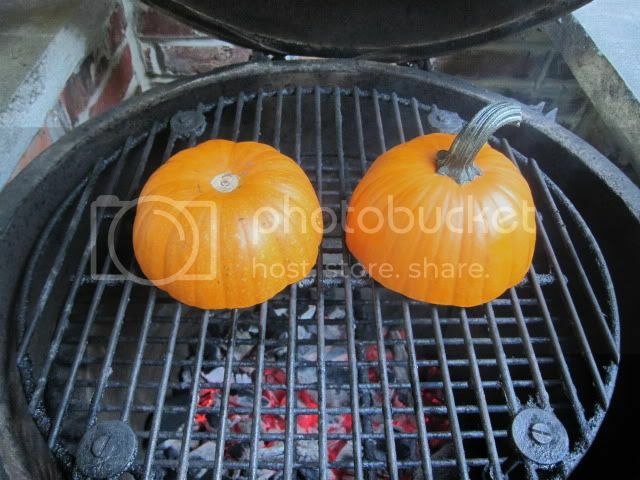 For Marc’s Dizzy Pumpkin Sliders, simply follow these directions (accompanied by images). Bon appetit! Richard in Melbourne, FL has been cooking on a kamado grill since the 60s when he purchased his first grill in SE Asia. Today, he owns four Big Green Eggs and has a database of over 100 Big Green Egg recipes including this one for Crown Roast. To view more of Richard’s recipes along with other contestants’ original Big Green Egg recipes, scroll down the Big Green Egg recipes contest category page. Vote for your favorite by checking on the Facebook “like” icon. The recipe with the most “likes” wins. If you have your own original recipe that you’d like to enter into the contest, email it along with your name/location and anything else you’d like included in the post to biggreeneggrecipes@outdora.com. For the contest guidelines, click here. Richard Howe from Melbourne, FL bought his first kamado grill in SE Asia in the 60s and he presently owns 4 Big Green Eggs. His current database of original Big Green Egg recipes EGGceeds 100! Many of Richard’s recipes can be found in the Big Green Egg recipes contest section of our site along with our other contestant recipes. The recipe with the most Facebook “likes” not only wins the official Big Green Egg cookbook but also will have their recipe featured by a celebrity chef at Sonoma’s first annual Big Green Egg festival (sponsored by Outdora). This Chinese Smoked Duck Thighs recipe for the Big Green Egg is a Richard Howe original. Richard began his kamado journey back in the 60s when he bought his first kamado grill in SE Asia. Richard resides in Melbourne, FL and currently owns four Big Green Eggs. He has quite the selection of Big Green Egg recipes. Scroll the Big Green Egg recipe contest selection to browse all submitted recipes. Pick your favorite by clicking on the Facebook “like” button. If you have an original Big Green Egg recipe that you would like to submit to Outdora’s Big Green Egg recipes contest, please email it to biggreeneggrecipes@outdora.com. Read contest guidelines here.